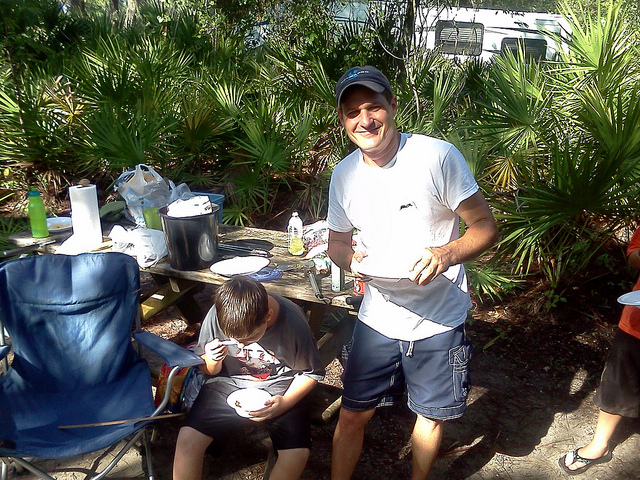 We had our first Royal Rangers camping trip with 12 boys and 5 Dads. 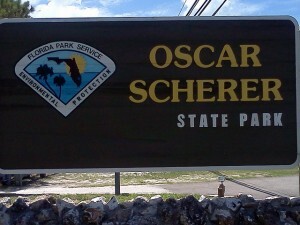 July 22-24 at Oscar Scherer Park in Nokomis Florida. I say first, because it was my first trip as commander. I haven’t been camping in a long time so I had my concerns that this would be a safe and happy trip for everyone. Fact is, the first day I was ready to give up. When my boys and I arrived at the campground it was raining, our tent was going up like wet spaghetti and there was poison ivy all over the place! I called Tom Good, on his way with his boys, and he said “Nick, God is good. Yeah, we may get wet and maybe even have to get a hotel but we will still have a great time.” Then I asked my boys do you want to reschedule this for another time or keep on going and they quickly replied keep on going. So that’s what we did. And you know what? It turned out to be the greatest weekend ever. I really believe the trip was not a success or failure because of anything I did or did not do. I truly believe God blessed our trip. Why would He be concerned about our little camping trip with all the trouble going on in the world? Because we asked Him too! So many times people, even Christians, just ignore God. I believe He wants to bless us especially in fellowship with His people who love Him. It did rain a little but it cooled us off! In fact some of us were cold in the night in the middle of July! And nobody was affected with poison ivy! Not one person. Any time you have a group of men and/or boys together with fire and knives, you are bound for trouble. But we all got along, safely, in one accord, and really enjoyed each others company. 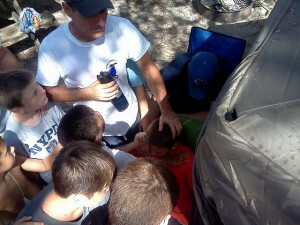 All the boys prayed for Luke to receive healing. 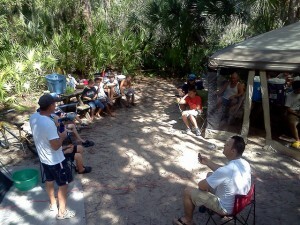 We will have another Royal Ranger Camping trip again soon around the same time next year. Do you know a boy K5-5th grade in your family or neighborhood that would like to go with us? Each class on Wednesday night has about 20 boys but we have room for more! Invite them in and let’s go Camping! 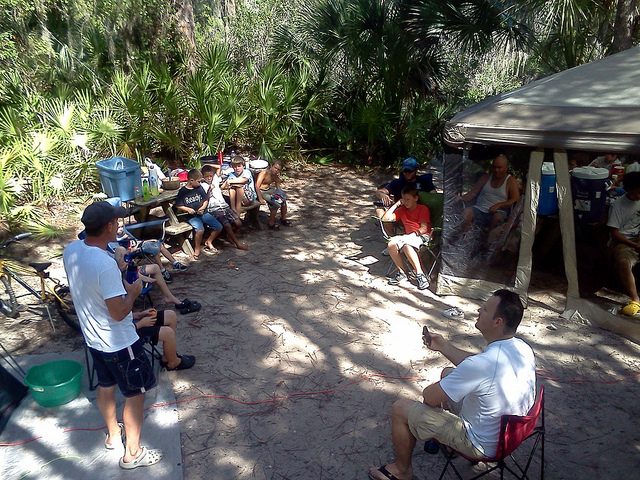 About half of the boys that attend RR come from families that are not church members or attend regularly. But that does not matter because eventually we may win the whole family for Christ through the boys! The bible says faith comes by hearing the Word of God. Our core mission is to teach the boys about God so that they may know Him and love Him. And that they are special and God knows them and loves them. Most of these boys already know a lot of bible stories but we teach them the WHY of the stories. Along the way we also learn about food, nutrition, exercise and taking care of ourselves like God wants us too. If you take care of your body for the first 50 years it will take care of you the last 50 years! We learn about being respectful to others especially our parents and being men of integrity, men of valor. These boys are our future! Invite a boy to Royal Rangers today and lets help make him a better man who loves the Lord tomorrow!